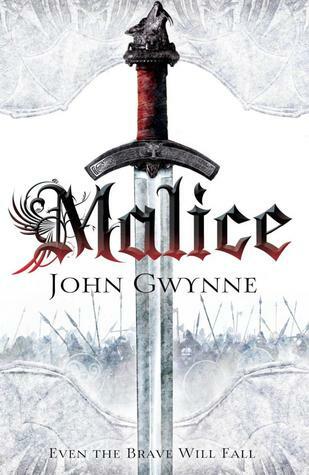 “Malice” is a classic High Fantasy tale of Good versus Evil in an all-consuming war set in a medieval-esque world. It tells the story of Elyon and Asroth, two gods, good and evil respectively, and how they use the creatures on earth to fight their war. We follow a colorful handful of characters throughout the book, every chapter another POV. Every element you would expect in such a classic tale can be found within the pages of Malice: heroes, destiny, betrayal, gods, a prophecy, war, battle, terrifying creatures and so on. Gwynne choses to fill his world with an elaborate cast of characters, telling his story from many different angles to give the reader a chance to experience the different sceneries, cultures and viewpoints, thus shaping an overall image of the many things going on, ultimately merging into one storyline in the end. Some of the characters really touched a string and pulled me in, like Corban and Cywen, but not all succeeded at that. I did really like his choice of POV’s, which were not always the most important pawns on his elaborate storyboard, but some secondary characters that give a different spin to the story and show another side of classic Fantasy. Gwynne also uses some tricks to give a twist to his story and to surprise his readers. You're never really sure who'll be on Asroth's side and who'll be one of the good guys. You just know all of them will have a part to play in the oncoming God War. The further you read along, the more the places seem to shift and the ones you already gave a spot on a certain team (Good or Evil) show another side that makes you rethink everything. The reader gets to know all of the different kingdoms throughout the story, so all the new information is never overwhelming or too much. We get accustomed with the different cultures and landscapes at an easygoing pace. Gwynne describes his scenery with just enough detail to help you paint a vivid picture in your mind, without the unnecessary long elaborations that usually make these passages tedious when overdone. The worldbuilding is rather marginal, not that detailed, more of a general image of the different kingdoms and their scenery than a close-up, which I actually liked a lot. I loved the explosive ending, which makes you yearn for the sequel, as a good ending should do. There is still so much that needs to happen, lots of tension hanging in the air, characters whose destiny is still uncertain… I’m really curious how all will come together in the second book. The writing is sharp, clean and reads fluently, although it’s not in league with the big names, like Martin and the others that are mentioned on the back cover. The pacing is very good, there's never a dull moment, the author knows how to keep his audience satisfied. The book is filled with exhilarating battles and action, enough to keep a fan of swordplay and medieval-esque battlefields satisfied. “Malice” is an enjoyable read and a strong debut and I will certainly be looking forward to the next installment in the Faithful and the Fallen series!